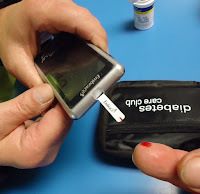 Alzheimer's & Dementia Weekly: Why is Alzheimer's Unofficially Called "Type 3 Diabetes"? Why is Alzheimer's Unofficially Called "Type 3 Diabetes"? Researcher's at Mayo Clinic, America's top research center, asked, "Is Alzheimer's triggered by a form of diabetes in the brain?" See Mayo Clinic's campuses in Rochester, Minnesota, and Jacksonville, Florida, participate in a multi-institution clinical study, testing whether a new insulin nasal spray can improve Alzheimer’s symptoms. It's an accepted fact that people with diabetes have a higher risk of Alzheimer's. One reason may be reduced blood flow to the brain because of damaged blood vessels. Dr. Guojun Bu, Ph.D.: "Therefore, the sort of supply of this essential nutrient to the brain is also impaired." Mayo Clinic neuroscientist Dr. Guojun Bu has found genetics may also be to blame. A variant of the so called Alzheimer's gene, APOe4, seems to interfere with brain cells' ability to use insulin, which may eventually cause the cells to starve and die. Unofficially it's called, "Type 3 Diabetes." Dr. Guojun Bu, Ph.D.: "What it refers is that the brain insulin utilization or signaling is not functioning. Their risk of developing Alzheimer's disease is about 10 to 15 times higher." Researchers wondered, if it is diabetes of the brain, could insulin delivered in an intranasal mist help? A Phase-Two clinical-trial raised hope. Dr. Guojun Bu, Ph.D.: "The outcome is very positive. Patient cognitive decline is slowed, if not improved." For the Mayo Clinic News Network, I'm Dennis Douda.